Afterschool was hit or miss for us this year as our kids had SO MANY SNOW DAYS and thus many of our visits were canceled. And now we're starting to wrap up the school year (yup - doesn't feel like it, but April will be our last month for Afterschool visits!). 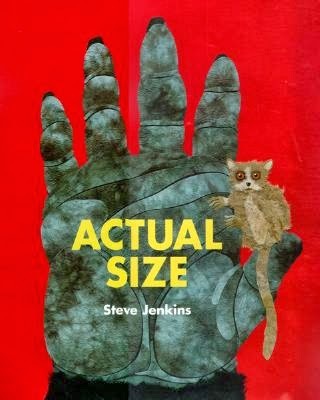 Actual Size by Steve Jenkins (HMH Books for Young Readers, 2004). This nonfiction book shares facts about many animals from around the world. The cool part? The illustrations are made ACTUAL SIZE, so they show you just how big (or small) these animals really are! The short, simple text makes this an easy one to read aloud. Kids LOVE learning fun facts about animals (and sharing what they know! ), so this is great for incorporating some nonfiction in your readalouds. 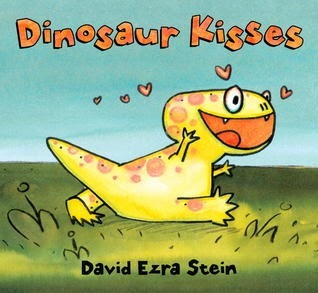 Dinosaur Kisses by David Ezra Stein (Candlewick Press, 2013). A baby dinosaur hatches and decides to give a kiss... but she doesn't exactly get it right the first time. After some whomping, stomping, and chomping, she meets a friend who can finally kiss the way dinosaurs kiss! At first the kids thought this was going to be a sappy story ("Is this a kissing book?" YEP! ), but it's actually funny. This is a great readaloud for February since it can go along with Valentine's Day, or for any time since it is hilarious. 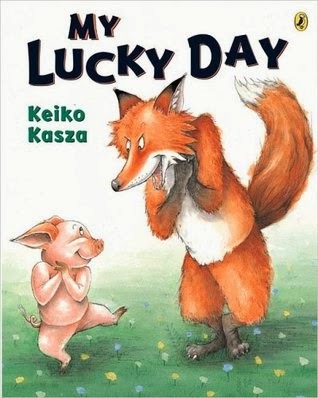 My Lucky Day by Keiko Kasza (Puffin, 2003). When a piglet shows up at Mr. Wolf's door, Mr. Wolf thinks it's his lucky day! How often does dinner just SHOW UP on your doorstep?! But after piglet's done with him, your listeners will know just whose lucky day it really is. This is another silly story that'll have the kids laughing. 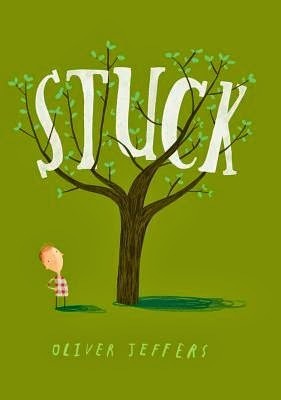 Stuck by Oliver Jeffers (Philomel, 2011). It starts with Floyd's kite. Stuck in a tree. And to get the kite down? Floyd throws his shoe at it. But guess what? The shoe gets stuck... and so on and so on until most of the neighborhood is stuck in the tree, too! This is a really wacky story and the kids really responded to the humor in it. There were other books, but these were my biggest hits this winter. For crafts, we did building squares, made Valentine's Day cards*, and colored slap blank slap bracelets (found on Oriental Trading!). What new books have you found that are great for K-4th readalouds? Any old standbys I need to know about? I'm always looking for new books to share with my groups! * After February 14 they became I love you/Happy birthday/Whatever cards. Make sure you have some different colors of construction paper and you're good to go. Kids LOVE to make cards.